Holy heck did it take me many tries not to ruin this tea. Take it from me: brew it cooler and shorter than the rest of your black teas. This tea goes bitter fast, and it goes bitter hard. That said, it's a good drink as long as you don't burn the leaves. It's earl grey, except with a floral, creamy, vanilla-ish touch. Brewed correctly, it's actually quite mellow, and I like the twist on the standard earl grey. Mornings are hard for me, and this tea does make them easier. It also smells really good, and is pretty with the touch of bright blue cornflower, both of which add to the sensory experience.It's sweet and creamy, and on the whole I do rather like it. It's an advanced-skill tea due to how quickly and how strongly it gets bitter: I would not recommend it for someone just getting into tea unless you make it for them or get them a timer. However, it's also inexpensive, so if you like earl greys with a twist and are willing to take the effort to not overbrew it, I'd say you do get a good value. 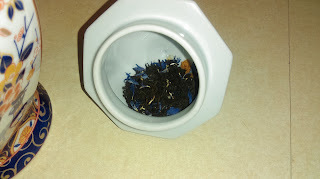 It also makes a nice base for blending with other floral teas (rose/lavender especially), and because you have to be careful with it anyway, and because it brews well at lower than usual temps for black tea, it would blend well with even green teas. In other words: A nice take on earl grey, inexpensive, but you may wind up with a bad cup or two before you get it right.